South American and Mexican scarlet macaws? There is a trick to properly identifying scarlet macaws--like standing an egg on its end, once you have been shown how to do it, it is simple. There are three basic groups: the northern group (Mexico), the Central American group and the South American group. Notice the wide yellow band of wing feathers on this Central American scarlet macaw. While answering a newspaper advertisement for a scarlet macaw (Ara macao), I identified myself as Barbara Gould, and the person who answered did not take the hint and identify himself. This started our identification process on the wrong foot. Realizing I was not going to get a name, and still interested in the scarlet offered, I proceeded with my next question. "What kind of scarlet do you have?" After another momentary silence, the person answered, "Bolivian. You know, the ones with the really wide yellow feather bands that are so big." "Okay," I said, "I will speak to my partner and get back to you if he is interested." This was yet another person who did not know the origin of his birds and/or did not take the time to research what he surmised to be a correct taxonomic identity. Anyone wanting to breed scarlet macaws or any other bird should take the time to be able to understand and identify correctly the species and subspecies without error or hesitation. Knowing the scientific names will put you heads above the rest as far as identification of any species. This may seem nit-picky to some, but if the practice of subspecies hybridization continues, these lovely creatures will be homogenized forever. 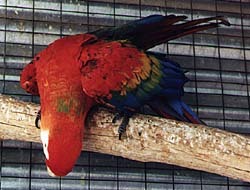 We have found that the most common scarlet macaw here in the southwestern United States is the Mexican type. They are quite colorful and are characterized by a narrow yellow band of feathers on the wing nestled between the red feathers on the shoulder and the blue flight feathers, generally only two rows wide (the edges being colored with shades of blue to green). These are not huge overall, like our Central American types; my Mexican scarlets average 908 grams. Their range has been considerably reduced in Mexico, limited now to where there are still jungles. It is the same old story: deforestation for agriculture. At one point, they ranged all the way up the east coast of Mexico to just before the northern deserts. Most of the Mexican type still living are in small local forested areas of southern Mexico. 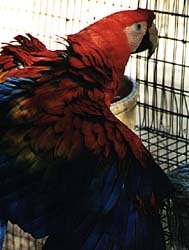 The Central American scarlets, which come from lower Central America (Nicaragua, Costa Rica, portions of Honduras and Panama, and occasionally as far north as Guatemala) are certainly the largest and most spectacular scarlets that we have seen We have heard of people bragging of tail feathers up to 36 inches long. Our Central American scarlets range in weight from 1,190 to 1,560 grams for males and 1,048 to 1,162 grams for females. These are large birds, not fat. These also have the widest band of yellow feathers that when combined with the long tail feathers identify them as Central American Scarlets. The yellow wing band is three to four feathers wide and also buffed by the greenish-blue tips, but only a slight amount of the tip of the yellow feather is covered by this greenish-blue color. Our Central American scarlets on average appear as large as greenwinged macaws (Ara chloroptera), although not quite as large as the hyacinth (Anodorhynchus hyacinthinus). We are fortunate to have many of these special birds in our breeding stock. Our dear friend Ralph Castro, from whom we have acquired several of our Central American birds, was raised in Nicaragua. His family kept a few of these wide-yellow-banded scarlets as pets and brought them to California years ago. Family pets were allowed fairly easy access to the United States then. One of the birds that Castro's family brought with them, the mother of four of my Central American scarlets, is approximately 68 years old, and she still produces a few babies every year. Castro told us he remembered as a child being paid 25 cents each to kill the wild scarlet macaws that fed on his grandfather's corn. Castro, as have many other people, has come full circle with birds. He is now raising them, not killing them! South American scarlets are generally not as large as Central Americans and have a narrower band of yellow feathers, very similar to the Mexican type. These are often called "Bolivian" scarlets, but that would be the point of export only and only on rare occasions the point of origin. Ours average 1,162 grams for the hens and 1,219 grams for the males. Here again, their ranges have been reduced significantly, until the last vestiges are in the Amazon Basin, at elevations under 1,200 feet. The marking that differentiates this type from the other two is a large turquoise-green area, commonly the size of a tablespoon, found on the nape of the neck. This is very distinctive. On my birds, this patch appears to be more prominent during breeding season. In their first year of life, this mark ranges from a tablespoon-size patch to about a teaspoon-size patch. Hybrids between the subspecies will often carry a smaller amount of these beautifully colored feathers in that area, usually not more than five or 10 feathers. There are probably more of these South American scarlet macaws left in the wild simply because the complete deforestation has not been as successful in South America as it has been in Central America and Mexico. The South American, although still plentiful in its natural habitat, is rarely seen in aviculture. 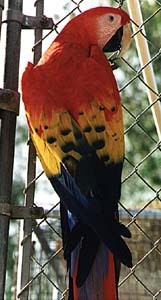 A narrow yellow band of wing feathers and smaller size are indicative of the Mexican scarlet macaw. The first good laugh I had about this was years ago, when an avian vet took the time to explain to me that the red and orange scarlets were, indeed, two separate subspecies. Since then, we have had a number of good laughs from people around the world. The only way to get an orange scarlet is to fade it in the sun. Our scarlets have the benefit of large flight cages and lots of sunshine and prove the point yearly. Our greenwings fade to orange, too. As the fall molt begins, the birds have orange feathers; midway through the molt, the feathers are orange and red simultaneously; and at the end of the molt, they are dark red again. If you keep your scarlets out of the sun or live in an area that is cloudy all year, they will keep the more vibrant red color year round. Scarlet macaws are the most widely distributed macaws, ranging from the state of Tamaulipas on the east coast of Mexico about 100 miles from the Texas border, southward through Central America (El Salvador being the exception) and into the Amazon Basin of South America. The scarlet macaw doesn't like the swampy areas, doesn't like the higher elevations, and it doesn't like the open plains, so it is generally confined to the dry jungle gallery forests and semi-open areas. They are resiliently adaptable to various ecosystems, if left to their own devices. Killing them for their feathers and for food, and encroachment by agriculture are drastically reducing their numbers. The old coffee plantations originally were helping out; because coffee has to be grown in the shade. This allowed the ecosystem to coexist with the animal life. The new coffee plantations, being run by large agribusinesses, discovered they could get more, cheaper coffee per acre if they cut down the whole forest and planted a different kind of coffee plant--one that could stand in the full sun, row upon row. This gives no diversity to the land and nowhere for the birds to live.